Wendy Mewes, author of this excellent guide to cycling the Nantes-Brest Canal, has this overview of Vannes, a good base from which to explore the Gulf of Morbihan. Situated at the head of the Gulf of Morbihan in southern Brittany, Vannes is a small, beautiful city with well-preserved medieval walls and streets of timber-frame buildings. The atmosphere is one of quiet, leisurely charm. The Treaty of Union of 1532 in which Brittany became a part of France was signed in Vannes. It was also the location of the Breton Parliament during its exile from Rennes in the late 17th century, a fluke of history which led to many fine houses being constructed for political notables. The little river Marle runs below the ramparts along the boundary of formal gardens where art exhibitions are displayed in summer. Here you will also find well-restored lavoirs, or traditional washing places from the 19th century. 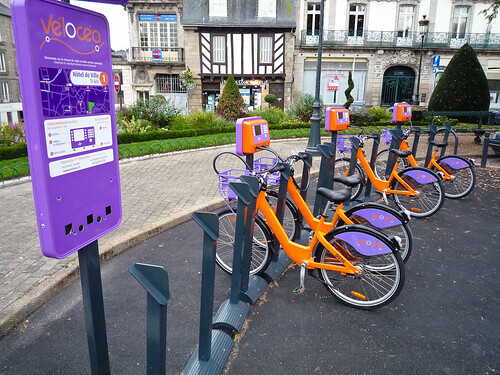 The colourful Vélocéa public bike hire scheme in Vannes. Vannes was the site of one of the original cathedrals of Brittany’s Founding Saints. In this case it was St Patern, a native Armorican, but today he has a separate church just outside the medieval city and St Vincent Ferrier, a Spanish missionary who died here in 1419, is honoured in the cathedral. His Renaissance style chapel there has just been restored. Nearby is a truly remarkable 13th century building. The Cohue was once a market with a meeting room for Parliament on the upper floor, but it now houses an art gallery. It’s well worth a visit to see the fine oak roof timbers. In the little square of St Vincent (note the tiny statue of the saint by the name plaque) you can see the famous wooden carving of a man and woman locally known as ‘Vannes et sa femme.’ A few feet away is the Chateau Gaillard, a really exceptional archaeological museum in a tall ancient building. The collection includes stunning artefacts from Neolithic Brittany. The pleasure port outside the monumental Porte St-Vincent is surrounded by lively bars and restaurants, the perfect spot for people and boat-watching. An easy 2km walk or ride down-river from here brings you to the Gare Maritime. The name Morbihan means ‘little sea’ and here you can get a boat for a scenic tour of the amazing Gulf of Morbihan, or a visit to one of the islands (including the megalithic marvel on Gavrinis). Vannes is fairly cycle-friendly, but the centre is small enough to explore on foot, and some of the narrower, older streets are cobbled. The city has a public bike hire scheme, Vélocéa (in French) (€5 per week or €1 per day, plus registration). You need to sign up in advance. From Vannes, cyclists have easy access to the area around the Gulf of Morbihan and many fine viewpoints over the islands, although the coastal path is not open to bikes. It's easy to access the Gare Maritime for excursions out to the islands, but not all boat companies accept bikes, so you may have to leave your own in the cycle-parking and hire another on one of the inhabited islands – the Ile d’Arz or Ile-aux-Moines – in the Gulf. Check the schedules of Navix (French) and Golfe Croisières (French). Carnac's famous standing stones are around 30km west of Vannes. A cycle tour of Presqu’il de Rhuys, about 20km south of Vannes, could include many Neolithic monuments, while the World Heritage site of Carnac is a little over 30km to the west of Vannes. 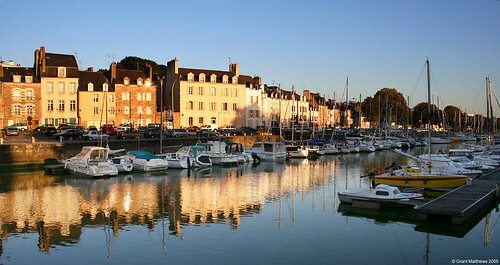 For more information, see the Morbihan or Vannes tourism sites. For bike hire and repairs, go to Cycles Le Mellec, 51 Ter rue Jean Gougaud, Vannes (02 97 63 00 24) or Culture Velo west of the city centre. For bike rental in France, also see our bike hire listings. Vannes is in southern Brittany; the ferry ports of Roscoff and St-Malo are in the north. The latter is the best bet if you want to take the train via Rennes to Vannes – see also our information on taking bikes on French trains. It would also be possible to use the existing green ways to cycle much of the way from St-Malo, but the development is not yet complete. For more details see the Randobreizh site (in French) or voies vertes. There are surprisingly few places to stay in the old city itself, but there is a a variety of modern hotels and B&Bs in the surrounding area. The tourist office website lists hotel options, as well as more than 20 campsites within cycling distance of the city. Check here for links to accommodation in France, including hotels, gîtes, gîtes d’étapes, B&Bs, self-catered and campsite options. There is no shortage of food options for all budgets in Vannes. Try the famous Croque Monsieur at the Café de la Poissonnerie by the fish market, or a quality crepe at the Dan Ewen creperie in an ancient building in the Place du Général de Gaulle. If you want something stylish, L’Eden in the rue Louis Pasteur is the best bet, but you may need to book. The restaurants around the pleasure port have a good variety of seafood menus. If you are self-catering, the indoor market Les Halles des Lices has fresh food daily and the main open-air market is on Wednesday and Saturday mornings in the Place des Lices. For fresh fish, the market at La Halle aux Poissons is a treat. Brittany's Green Ways: A Guide to Re-Used Railway Tracks and Canal Towpaths (UK, US, Fr) is an invaluable guide for cyclists and walkers. French publisher Rando Editions has a guidebook, Le tour de la Bretagne à vélo, in French. See the Footprint guide to Brittany (UK, US) for a general tourist overview; Footprint also has a new Brittany With Kids (UK, US) guide for families, while Lonely Planet has a Brittany and Normandy book. Michelin has a regional Brittany map (UK, US), as well as a green guide to Brittany (UK, US). IGN also has a regional map of Brittany (UK, US, Fr). The IGN site also carries dozens of more detailed maps covering every corner of Brittany and its departments. In the UK, Stanfords bookshop has an excellent range of Brittany books and maps, including hundreds of IGN maps. See also Wendy's Freewheeling France guides to cycling the Nantes-Brest Canal, as well as her history of the Nantes-Brest Canal. She's also written our guides to St-Malo, Rennes, Brest and Quimper.